One of the most significant dates in Celtic times was the Festival of Bealtaine. 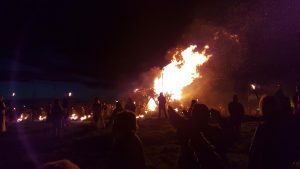 Around May 1st is when the ancient festival of Bealtaine (also called Beltane) took place, about halfway between the spring equinox and the summer solstice. Like many other Celtic festivals the date has an agricultural significance as it symbolised the start of the summer and was when the herds of cattle were driven out to the summer pastures. Rituals were performed to protect the cattle, people, dairy products and crops from harm (both natural and supernatural – the Celts were a superstitious people!!). The aos sí (spirits or fairies) were thought to be extra active at Bealtaine, so the rituals that were performed were to keep the spirits/fairies happy. Rituals to encourage growth were also performed. Special bonfires were lit during the festival and it was believed that the fires had protective powers. 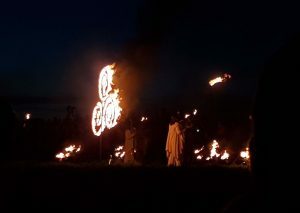 The main Bealtaine bonfire was lit at the Hill of Uisneach in County Westmeath which was said to be the mythological and sacred centre of Ireland and many bonfires around the country were lit from this main bonfire (photgraph from a more recent Bealtaine bonfire at the Hill of Uisneach is featured below). The people and their cattle would do a lap of the bonfire or walk between two bonfires, and sometimes even jump over the flames!! Mad stuff altogether!! But why?? Walking between two bonfires was believed to be a rite of purification. So, cattle were driven between two fires in many villages. It was even considered lucky for people to walk between two fires and to be honest I’m a huge believer in luck and would definitely do the walk between two bonfires today if I thought it was lucky  But those that were mad enough to leap over the bonfire did so in the belief of fertility for the following year. On the morning of the Bealtaine Festival many people would collect yellow flowers at dawn from the rowan tree, hawthorn and hazel tree etc. to hang across doorways or on the outside of the windows of their homes. The yellow symbolised the fire. Bealtaine is said to derive from Old Irish, meaning “bright fire” where Bel means light – the Celtic sun and healer god was Belenus. The word Bealtaine is still used in Gaeilge (the Irish language) and translates as the month of May. Today the traditional bonfires have been revived in many areas in Ireland as part of local festivals celebrating the start of summer. Do a google search for Bealtaine Festival to see what might be taking place beside you…. Like what you read and see? Then sign up to my newsletter here. I’m ALLERGIC to SPAM so promise not to clutter your inbox! This entry was posted in Heritage and tagged Bealtaine, beltane, celtic festival, Celtic fire festival, celtic rituals, Tracy Gilbert Designs.